Throughout my running career and as a fan of this sport, I had never experienced the feeling that wafted over me while observing the utter demolition of Wang Junxia’s, an admitted doper, 1993 mark. We’ve scarcely witnessed at any Olympics in recent memory any world-record performances in the sport of distance running, let alone anything of the magnitude witnessed in this race, not merely by its champion and her fellow compatriot but by a host of others in the field, one of whom dipped below the 30-minute barrier (29:53.51) only to fall short of podium contention. In total, seven of the all-time fastest twenty-two female 10,000-meter performances were run in Rio yesterday. Four of those now claim a spot within the top five of all time, with the Rio ’16 champ claiming dual residence in the number one spot and at number twelve on the all-time list, the latter of which was, oddly enough, run just over a month ago in Hengelo, yielding a rather lukewarm time of 30:07.00. Additional spots claimed today on the all-time list are fifteen, twenty and twenty-two, the penultimate of which is the performance of Molly Huddle, improving upon Shalane Flanagan’s ’08 bronze-medal time of 30:22.22 by over nine seconds. The female 10,000-meter world record now stands precisely three minutes away from the male 10,000m mark, set by Kenenisa Bekele in 2005 at the age of 23, at that time bettering his own world record from a year earlier by roughly three seconds. 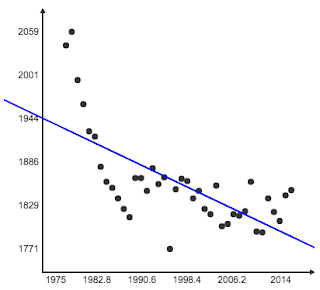 Of course, the progression of the male record reveals an interestingly low delta between marks, yielding a maximum range of approximately 9 seconds since 1965. When assessing the IAAF world records for the female side, the intelligent reader might just as readily classify all of the performances as doped. Oddly, there are merely nine world record marks between 1981 and 2016, seven of which occurred in the ‘80s primarily by athletes from Russia’s Soviet Union and a lone American by the name of Salazar-coached, testosterone-enhanced Mary Decker-Slaney, Ingrid Kristiansen of Norway, admitted doper Wang Junxia of China and now-Olympic Champion Almaz Ayana of Ethiopia: not the most illustrious of lists. One of two or more reasonable conclusions can be reached after viewing this event: either the track is short or the field is juiced. Or maybe I’ll wake up in the morning and this will have all been a dream, or even better I’ll be prepared for 2-mile repeats at 4-minute pace at Sawyer Camp. Obviously the haze of history prevents me from perceiving this performance as anything remotely resembling legitimacy, but this data surely, of its own might, fails to specifically eliminate the possibility of this kind of aberrational achievement. Of course, I believe that aberrations of this scale are to become ever more improbable in what has materialized to become an increasingly-thicker and rapidly-vetted market of talent. If a male were to aim to match the relative progression of yesterday’s world-record performance, he would need to run 26:05 (if we are comparing to the delta between the new record and the mark posted in 1993 by admitted doper Wang Junxia) or 25:46 (when comparing to the next best, still-untouchable mark of 29:53.80 set by Meselech Melkamu in 2009 at sea level in Utrecht in the Netherlands). A cursory comparison between times at Rio and the 10,000-meter final at the 2015 World Championships in Beijing will render the latter something like child’s play. Vivian Cheruiyot won gold with a time of 31:41.31 while Gelete Burka and Emily Infeld took silver and bronze, respectively, with times of 31:41.77 and 31:43.49. Molly Huddle, Sally Kipyego and Shalane Flanagan rounded out the top six with times of 31:43.58, 31:44.42 and 31:46.23, respectively. An investigation into season’s best times returns the following: 30:49.68 by Delete Burka (2015); 30:42.26 by Sally Kipyego (2014); 30:08.06 by Deseret Defar (2013); 30:20.75 by Tirunesh Dibaba (2012); 30:38.35 by Sally Kipyego (2011); 31:04.52 by Meselech Melkamu (2010); 29:53.80 by Meselech Melkamu (2009); 29:54.66 by Tirunesh Dibaba (2008); 31:00.27 by Mestawet Tufa (2007); 30:21.67 by Elvan Abeylegesse (2006). The Dow Jones Industrial Average would need to gain by more than 500 points, discounting trends, trade volumes and projected growth, to emulate yesterday’s performance relative to the aforementioned delta. Of course, this is just a comparison of averages, controlling for all exogenous forces. The cited DJIA equivalent is actually far more likely a scenario, due to the dynamic psychology of investors and the scale of influence bearing on daily market sentiment, especially in a high-volatility environment. Athletes, however, build upon prior successes and generate confidence and augment skills and heuristics, to an average limit, in Fibonacci style. Whereas competitive financial markets are representative of risk appetites and opportunity costs, constantly adjusting to geopolitical events, economic data and projected monetary and fiscal policy, the human athlete is relatively impervious to whimsical conjecture on race day. However, much like the financial markets’ trading around technical levels, the human athlete’s capacity is not merely revealed by present trends or current world records, but his or her ability is actively influenced by these perceived caps on human attainment. At any rate, yesterday’s performance resides comfortably in outlier territory and will remain the subject of scrutiny for decades to come. Just as with the financial markets, the days, months and years ahead will either validate the move as a black swan or will render it a freak aberration. 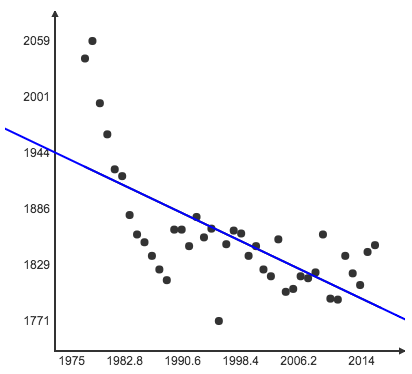 Based on a standard linear regression across the past four decades, where y = -3.64x + 9129.8, inclusive of every year’s leading performance, a female 10,000-meter time of 29:17 is roughly 48 years ahead of schedule. To put this into perspective, the S&P 500, currently hovering around 2,200, would need to achieve a forecasted 13,861 to match this feat.